Here at HomeBrew Techniques we are unashamed lovers of the hop. To us the humble hop contributes more to beer than the humble little cone suggests. Take for example that beautiful burst of hop aroma that meets you as you go to take your first sip. Nothing, in our opinion beats it. However, for the purpose of this article I am going to reveal to you a little of my daily bathing rituals. Every morning I have a shower, and I am not ashamed to admit that I wash my rapidly thinning hair with a brand of shampoo that you would find in some rather exotic hair salons. Sadly this is not because I am overly precious about what I use to wash my hair but because that is what the wife leaves in the shower after she has got out. Don’t forget I am but a man after all! Now you might ask what on earth has this got to do with hops? Well bear with me and I will reveal all. One particular day not that long ago the morning sun had been streaming through the bathroom window right onto the shampoo bottle, which being stylishly black, had absorbed all the warmth with the result that the shampoo inside was quite warm. When I popped the top of the bottle the full glory of the aroma hit me and, as aroma can do, the memory of sitting in a beer garden supping a cool pint of golden ale was pulled from the darkest recesses of my brain. Now it surprised me that the aroma of a well known shampoo brand should conjure up a long buried memory of beer but on closer inspection of the shampoo’s ingredients the answer to the mystery was provided. Two of the aroma compounds in the shampoo, geraniol and linalool, are essential oils found in many plants, but more importantly they are found in hops. The combination of the two in the shampoo successfully triggered a very welcome memory of a fantastic pint of beer. Hops are essential for beer’s bitter taste but, to many beer lovers, especially the hop heads amongst you, it is the oils that define what hops really give to a good beer – hop aroma. Compare a beer hopped with East Kent Goldings, it should have a smooth, almost sweet and delicate spicy aroma, against a beer hopped with Cascade with a powerful floral, citrus and spicy aroma. The difference between the two is unmistakable. If you don’t believe me you can try this for yourself as many brewers now brew single hop beers which help to highlight the unique flavour properties of a particular hop variety. With such clear differences it could be suggested that hop oils give a particular variety its own unique hop aroma fingerprint and that is why aroma hops are so prized amongst brewers. 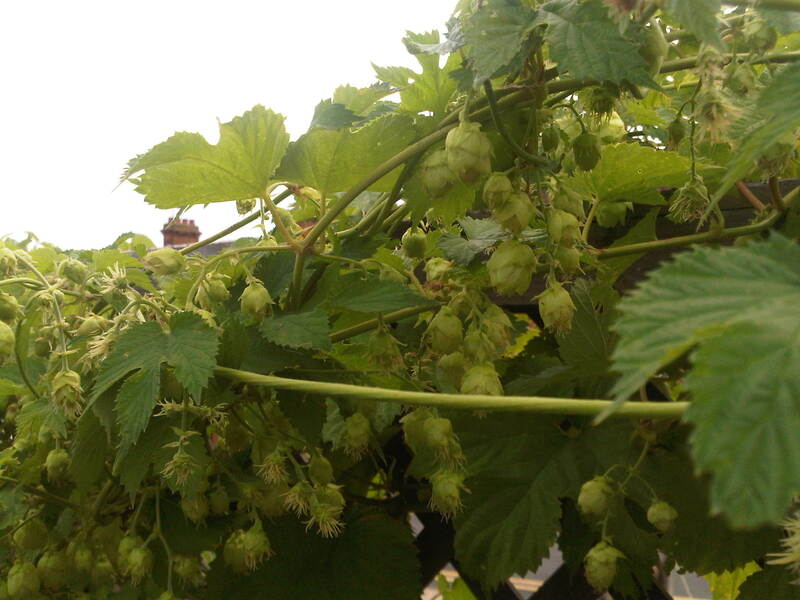 Hops are hardy climbing herbaceous perennial plants growing rapidly during the spring and summer to a height of at least 16 feet (5 m). Although the plant itself is large the brewer only uses a very small part of it – the cone. For the brewer the important constituents of the hop, the resins and oils, are found in the lupulin glands at the base of the hop cone. The resins, and in particular the alpha-acids, are responsible for the characteristic bitterness. However, it is the oils which provide the wonderful hop aroma and are, for many, what defines the difficult to describe hoppiness of beer. The brewer will select hops on the basis of what they want them to do in their beer. Therefore hops fall into one of three groups depending upon whether they are high in alpha-acids and so good for bitterness, have a good oil composition so would be ideal for aroma or have a little bit of both. The three groups are defined as bittering hops, aroma hops and dual purpose hops. Therefore varieties such as Target and Admiral which contain high alpha-acid levels are classed as bittering hops whereas, East Kent Goldings which contains low levels of alpha-acids but has a good oil composition is an aroma hop. The oil component of hops range from 0.03% to 3% of the weight of the hop cone, compared to the resins which can constitute up to 15%. However, hop oils are produced late in the ripening stage, after much of the resin has been laid down. It is therefore crucial that the hop grower, if they are growing aroma hop varieties, harvest them at just the right time so that they can maximise the levels of oil in the cone. The oil itself is a complex mixture of at least 300 compounds consisting of exotically named substances such as geraniol, linalool, myrcene, caryophyllene and selinene. Although brewing scientists have managed to identify most of the individual components that constitute hop oil nobody has, as yet, been able to establish a relationship between the composition of the oil and the aroma characteristics that it delivers. This, for many, is seen as a good thing because it means that there is still a reliance on the skill of the brewer to be able to combine the hops in the right proportion and also add them at the right time during the brewing process to deliver the desired results. This is not an easy thing to achieve and is the difference between a good brewer and a master, an average beer and perfection. The components of hop oil are extremely aromatic due to the fact that they are relatively volatile. This means that the oil constituents have a low boiling point and change from liquid into gas at a low temperature. This is an essential property of many of the components that make up hop oil and it is what enables us to smell them. However, this important property presents the brewer with a slight problem. The bitter flavour in beer is created by boiling hops with the sweet wort. Unfortunately because the hop oils have a low boiling point all the wonderful hop aroma disappears up the brewery chimney or, if you are a home brewer makes your kitchen smell rather delightful. Therefore if beer is to have any hop aroma the brewer has to be very careful when he or she adds hops to the wort boiling stage. Generally hops are added in two charges to the kettle. The first addition of hops occurs at the start of wort boiling to maximise the formation of the bitter flavour. The second addition of hops occurs towards the end of wort boiling to make sure that some hop aroma survives into the finished beer. Brewers refer to this as a beer’s late hop character. 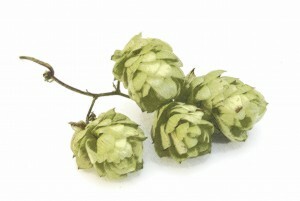 Brewers may additionally use a technique known as dry hopping to maximise the hop oil content of the beer and therefore the hop aroma. Dry hopping is where hops are either added to beer in a conditioning tank in the brewery prior to packaging, or directly into the vessel in which the beer is delivered for consumption. This is a technique which is often employed in the production of traditional British cask ales. The advantage of dry hopping is that it produces an immense fresh hop aroma that is not often as apparent with late hopped beers where the aroma properties of the hop oils can be modified by the action of yeast during fermentation. The home brewer can replicate this technique by adding hops directly to the fermenter. This can be done at the start of fermentation but to maximise the benefits I tend to add my hops when I transfer the fermenting wort from my primary fermenter into my secondary fermenter after 3 – 5 days of fermentation. I will cover this in a bit more detail in an upcoming article. Whether it is achieved through late or dry hopping the ultimate goal of the brewer is to create a beer with a well balanced hop aroma. It is clear that hops are much more than just the bitter taste in beer. Without hop oils many of the subtle flavour characteristics of some of the worlds greatest beers would be absent and for that fact alone the humble hop will always be cherished by those who love their beer and hop aroma. Oh yes they also make your hair look and smell great!